Crisply delicate yet resonantly deep. Blackberry, tea rose, clover flower, grapefruit zest, musk in aroma and cup. In structure intensely tart yet very sweet, with a slight deepening savory edge. Light and silky in mouthfeel. Superb finish: sweet, flavor-saturated, long, intact in aromatics and structure. 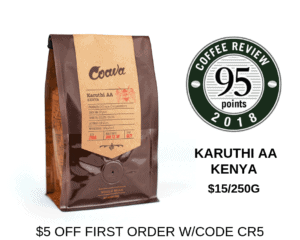 This distinguished and unusual blend is comprised of coffee from three distinguished origins, Ethiopia, Guatemala and Kenya. Mi’s Café is an in-store roaster and coffee shop in Kaohsiung City, Taiwan. For more information, call 886-7-2010188, email andy16845@gmail.com or visit www.facebook.com/MISCOFFEE. The Bottom Line: The blender’s art at its finest: an original and complete cup.